The Salem Red Sox dropped the Lynchburg Hillcats (ATL) 6-1. Salem scored one run in each of the first two innings, and picked up four more in the bottom of the fourth and fifth. Designated hitter Tim Roberson earned his keep by collecting two hits, a double and a triple, and scoring two runs. Salem amassed only three RBI, which were tallied by Matty Johnson, Aneury Tavarez, and Ryan Dent. Starter Pat Light lasted only two innings and gave up only two hits and no runs. He was lifted for Kyle Kraus, who picked up the win. The Greenville Drive took home victories in both halves of a doubleheader on Friday defeating the Hagerstown Suns (WAS) 8-2 and 2-0. In the first game the Drive took an early lead scoring runs in the first, second, and third innings, and never relinquished it. Right fielder Forrest Allday was 3 for 4 in the game with three runs scored and one triple. First baseman Jantzen Witte went 3 for 4 with four RBI and one run scored. He also hit a two-run home run, his seventh of the season. Drive starter Daniel McGrath lasted five innings yielding only three hits and two walks while striking out four. He also surrendered two earned runs. The second contest was much closer, but the Drive were able to eek out a 2-0 victory. Starting pitcher Myles Smith put together a strong performance yielding only two hits and one walk in six innings pitched. Smith also struck out two while surrendering zero runs in the game. Allday was the only player to collect a multi-hit game in the second contest; he went 2 for 3 with a double and a single. The lone RBI came off the bat of catcher Craig Manuel, who belted a home a run in the top of the third inning. The Lowell Spinners defeated the Vermont Lake Monsters (OAK) 7-2 behind a strong staff-wide pitching performance and some timely hitting. The Lake Monsters jumped out to an early 1-0 lead, but the Spinners quickly responded with two runs of their own in the bottom of the second inning. Right fielder Nick Longhi was 3 for 4 with two RBI in the game. Spinners shortstop Mauricio Dubon clubbed a two-run homer, his first of the young season. Spinners starter Jason Garcia, a right-hander, yielded no earned runs and two hits in four innings of work. He also struck out five batters. The DSL Red Sox crushed the DSL Mariners 16-7 on Friday. The DSL Red Sox launched a 15-hit attack spearheaded by Luis Alexander Basabe, who was 4 for 6 with seven RBI. Basabe did it all with just one extra-base hit, a triple. Right fielder Yoan Aybar was 3 for 5 on the day with two runs and two RBI. Third baseman Luis Benoit did something interesting by scoring three runs while only registering one official at-bat. Benoit, who also picked up two RBI, was one for one with three walks. Player of the Day: DSL center fielder and leadoff man Luis Alexander Basabe put together a box score to remember on Friday collecting four hits and notching seven RBI. Basabe, 17, is in his second season in the DSL and is batting .349 with 14 RBI and seven steals. 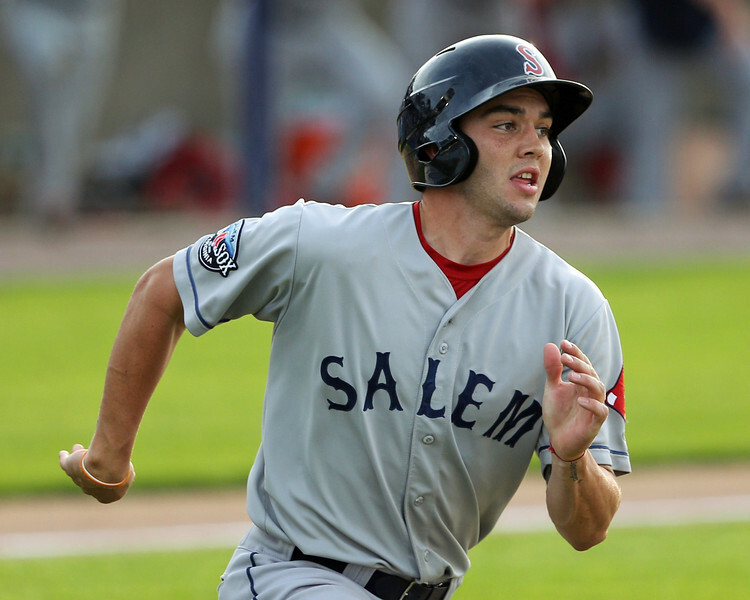 Photo Credit: Blake Swihart by Kelly O'Connor.